random thoughts on halloween night. I’m sitting on a chair in my brother’s kitchen, computer resting on the bar. A fly got in the house and is circling the two dinner plates to my left. I just finished some pizza my brother and sister-in-law made. It was pretty good, but I almost choked on the cheese. I am sitting right near a door to the backyard. The large black golden doodle dog is used to being inside, but he is staying outside for awhile. We are concerned that when kids and adults come to the door, the dog might react negatively and we don’t want that. 6:44 pm right now, still a bit of light left here in Idaho. Just got our first trick-or-treaters. The dog continues to whine and bark and maybe I should sit somewhere else. He can’t see me.. we have closed the curtains over the door, but maybe he can sense me somehow, or hear the clicking of the keys as I type. My brother and his wife have three children. Eldest nephew is 13, niece is 11 and younger nephew is 8. Oldest nephew didn’t want to don a costume this year or last, preferring to hang out at home, watch science programs on a laptop computer, and pass out candy when we get a knock on the door. Last year at this time, besides passing out candy, we watched many many episodes of a very funny British animated show called “Shaun the Sheep.” That was fun. It’s quiet in here now though, except for the bit of sound from youtube on the other computer. The younger two were surprisingly reluctant to put on their costumes. My brother was trying to convince the 8 year-old to wear a pirate costume of sorts.. mostly a mask, pirate hat, bandana and some old clothes. Nephew said he wanted to be a zombie cowboy instead and was starting to cry about it. I said might as well let him wear whatever he wants. He ended up wearing, besides the skull mask, a western shirt, bandana with pirate stuff on it, a western style belt, and for reasons only he knows, an authentic Australian-made boomerang tucked into his belt. Why not. They’ve been out less than an hour so far, and I hope they are having fun. I don’t mind not having a Halloween party to go to tonight. I’ve had my fun on Halloween in the past. Back in the ’90’s, I had a friend named Wendy (we were friends for 8 years) who always had fairly mellow but fun parties at her house. Wendy and I weren’t interested in dating each other, but she had female friends and I had male friends. She dated one of my friends for a long time, and I went out with some of her friends. Some Halloween parties at Wendy’s went… pretty well for me, depending on what women she invited. Since the late ’90’s though, I haven’t been to any Halloween parties. Apart from spending time with relatives, I’ve mostly kept to myself, not just on Halloween, but in general. Not many memorable Halloween nights since 1998 or so,, except for the night back in 2001. I was working at a phone company as a telephone operator who assists deaf people. One of my co-workers, an unhappily married woman, had been flirting with me for months and I with her. I don’t make a habit out of dallying with married woman, but.. I don’t remember many Halloween nights since then. I remember one Halloween night years ago, back in California.. an especially cold night. Brother and family lived across the street from a large park, and there was always a large civic event there each Halloween. Big crowds. We took the kids out, but for some reason that remains a mystery, we did not take strollers to push the two younger kids in, in case they got tired. The oldest was plenty old enough to walk around by himself. My niece was too, but she was very tired, so I ended up carrying her quite a bit, and my brother and sister-in-law took turns holding my younger nephew. Apart from the fatigue in my arms from continuing to carry my niece, it was a pleasant night, even though it was colder than it usually got in late October. The crowd was in a festive mood. Free wagon ride through the neighborhood and cider to drink. That was a good Halloween night. 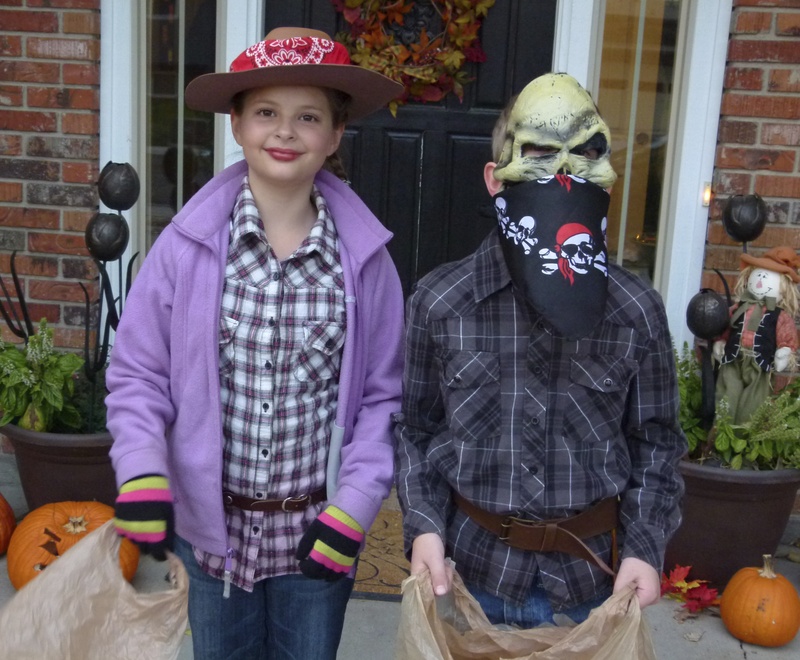 I don’t remember when I stopped trick-or-treating, back when I was a kid. I think it was when my family moved from a mid-size city in CA to Chicago, shortly before my 11th birthday. The Chicago neighborhood we lived in had some safe parts, but still, not the best place for trick-or-treating. I guess that was when I stopped. Might have attended a harvest party at church the following year. Some church communities don’t like the word “Halloween,” because they associate the holiday with Satanism. But these church communities still have parties on Halloween night, and allow the kids to dress up. The parties are called “harvest parties.” Silly Christians.. the phrase “harvest party” still sounds rather pagan. And many Christian communities equate paganism with Satanism, although I do not. I suppose people in these churches don’t realize “harvest party” sounds pagan, or they’d yet again change the name of the event. I don’t have any kids of my own to take out trick-or-treating or to a church for a harvest party. I never got married, never started a family, so my brother’s kids are the closest I’ve gotten to having any. This is close enough. I help out with the kids at least once a week, and hope to be a helpful presence in their lives for many years to come. Even as I am sitting here typing this post, I am being helpful, by allowing my brother and sister-in-law to walk with the two younger children while I stay with the oldest child. Yes, he is 13, and we live in a safe city, but it is still good to have an adult around, especially on Halloween. I was contemplating being somewhere else this evening. A few pagans were planning on having a service tonight, because it is Samhain (pronounced saw-win, or something like that), the pagan new year, so I’ve been told. But, after years of intermittently thinking I’d become pagan, I finally realized that I am not one, nor am I ever planning on being one, so I did not go to the pagan service at the Unitarian Universalist church down the road. A Wiccan community across town is having a Samhain service and drama presentation tomorrow, which I find strange. I’ve always heard pagans celebrated on October 31st. November 1st is All Saints Day, a Catholic holiday. My catholic convert parents and aunt might go to church tomorrow. I will be staying home tomorrow evening. A few weeks ago, I was in a large spiritual store in which the Wiccan coven meets. I heard about the service, and asked the rather pagan-looking middle-aged dude at the counter what the service would be like. This guy, who was sporting rather long hair and trimmed beard, jeans, long-sleeve shirt, black leather vest and leather bracelets.. standard uniform for mister cool pagan guy, I guess.. he didn’t want to tell me about the service. He said a few vague things, and then kept saying he didn’t want to give anything away. I was turned off by his words and demeanor. I’d like to know about a pagan service before I decide to show up, but he wanted to come off as mysterious, so I chose not to buy a $5 ticket to the event. I probably would not have gone anyway, but the guy behind the counter made it easier to stay home. I would like to live more in touch with nature, and maybe even in some way celebrate the pagan holidays, but I don’t believe in any pagan gods or fairies or whatever.. actually.. I would say I’m agnostic.. maybe such beings exist, and maybe they don’t. I don’t think there’s any room for an agnostic in a Wiccan community. So.. I won’t be celebrating Samhain, tonight or tomorrow. Tmw. is November first, a Friday, and that’s good enough for me. A movie I have been waiting for, “Ender’s Game,” is coming out tomorrow, I have two great instruments which I just bought, and really like to play, and I don’t have to get up early in the morning. Don’t need Samhain, don’t need All Saints Day. Friday November 1st will do just fine. Tonight, after the kids have gone to bed, I might eat some candy if there is any left over, if the kids who come to the door don’t get it all. I’m not going to raid my niece’s and nephews’ stash. Some things are sacred, including Halloween candy a kid has gathered from the neighbors. Once the kids are asleep, my sister-in-law will probably head up to bed, and maybe my brother and I will watch my favorite TV show, “Community,” (which is not British) on DVD, or just hang out a little while and talk before he too gets tired and heads off to bed. Once home, I’ll play my ukulele and guitalele, maybe read a bit, and watch something mild like a light drama British TV show, or a mellow movie from the ’80’s I found at the library, or finish the documentary I started this morning about kids at a Los Angeles high school for musicians, singers and dancers. I don’t have an appetite for horror films.. well.. mostly not. There is one horror movie I watched last year called “Cabin in the Woods.” I almost never watch horror movies, except for the occasional zombie flick (“Shaun of the Dead” is my favorite), but this movie, I have to say, was good. I won’t likely be watching it though. I’m trying to put good things into my mind. I mostly avoid gory movies and shows, and will be watching tame, peaceful entertainment tonight. The kids and their parents have returned, so I shall end this post here. Thanks for reading. I hope your Halloween night has gone well. ← from the archives: boise photo walk 3/12.